Other Common Names: American cranberry, bog cranberry, atoca, bearberry, bounceberry, craneberry, Amerikanische Moosbeere (German), canneberge à gros fruits (French), arándano Americano (Spanish), Amerikanskt tranbär (Swedish), amerikankarpalo (Finnish). 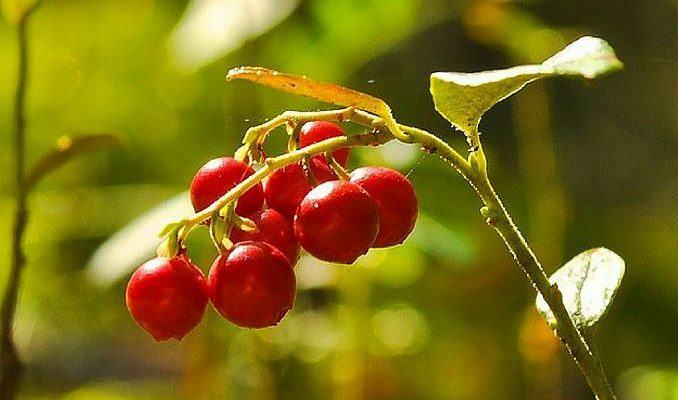 Habitat: American cranberry is native to eastern and northwestern North America. It is also naturalized in some parts of Europe with suitable climate. Description; The cranberry is a perennial shrub from the family of Ericaceae. Other members of this family are the blueberry, the salmonberry, and the smaller European cousin of the cranberry with similar taste, the lingonberry. The one to four inches high shrubs have sprawling vines that can grow very long. The evergreen leaves are positioned alternately. The leaves develop from a light green and maroon color when young into a shiny dark green. The light pink flowers appear early in mid-summer in clusters of four or five. 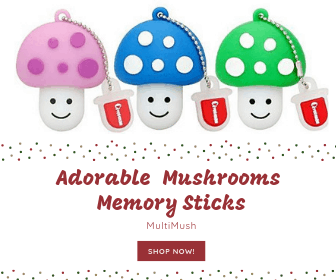 The plant prefers full sun or light shade and can grow in well-drained as well as in constantly moist soil. They can withstand extreme cold. Plant Parts Used: The berries. The tart, red berries are used in a variety of foods products and beverages and dietary supplements are available in the form of teas and extracts formulated into capsules or tablets. Beverages range from 100% unsweetened cranberry juice to cocktails with high sugar and low cranberry juice content. Cranberries contain many phytochemicals that are biologically active like proanthocyanidins, quinic acid, hippuric acid, tannins, Vitamin C, pterostilbene, and other antioxidants. Traditionally, cranberry products have been used to prevent and treat urinary tract infections (UTI). Though in the past many not well controlled and too small studies have been done to investigate the ability of cranberry juice to prevent UTIs gave inconclusive results, there is more and more data accumulating that cranberries can indeed be beneficial in the prevention of UTIs. The mechanism is not fully understood but many in vitro tests (test in the test tube) have shown that the proanthocyanidins contained in cranberries can inhibit the bacterium E. coli, which is responsible for 70-80% for all UTIs from adhering to the cells that line the bladder. This adhesion of the bacteria is a necessary first step before they are able to establish an infection. 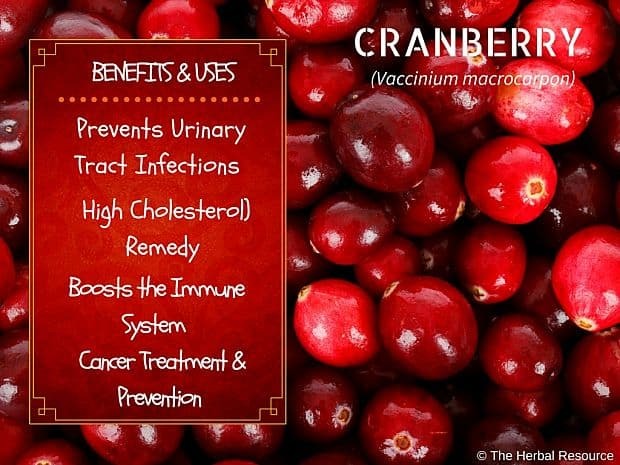 Two other compounds found in cranberries, quinic acid, and hippuric acid, might also help in the prevention of UTIs. These substances are weak acids that unlike other organic acids are not degraded in the body but secreted intact by the kidneys. They, therefore, make the urine slightly acidic, which can help keep bacteria from growing in the urinary tract. However, no study to date has shown that drinking cranberry juice can treat an established bladder infection. Since untreated bladder infection can lead to a more serious kidney infection, a doctor should be consulted if symptoms like frequent and painful urinating and urgency are observed. The ph-lowering effects on the urine of hippuric and quinic acid might also be the mechanism by which drinking cranberry juice can prevent kidney stones. Most kidney stones form from calcium oxalate and other weakly soluble calcium salts. In weak acids, these compounds are soluble and can be flushed out of the kidneys before they can precipitate to form kidney stones. The antioxidants contained in cranberries can delay aging and though no conclusive studies in humans have been done so far to establish cancer preventing effects of cranberries, it has been shown that antioxidants, in general, can prevent certain cancers. Additionally, experiments with cranberry extracts in tissue culture provide evidence that the antioxidants and proanthocyanidins can reduce cancer growth. Cranberry extracts have antibacterial activity that can be beneficial for the treatment of Helicobacter pylori infections, a bacterium that can cause stomach ulcers and plague. Cranberry has been used as an herbal remedy for high cholesterol. The tannins in cranberries prevent the oxidation of cholesterol, an effect that can lower the levels of bad cholesterol in the blood and promote heart health. The anti-inflammatory effects of tannins can be of additional benefit for the natural prevention of atherosclerosis. Eating diets rich in cranberries and other fruit has also been shown to be good for the prevention of age-related macular degeneration, a condition that can cause vision loss in the elderly. A typical dosage of commercial cranberry extract as herbal medicine is two 400 mg capsule, one in the morning and one in the evening. Otherwise, the manufacturer’s instructions should be followed. Few glasses of pure cranberry juice that has not much sugar added to it can be used as a substitute for the capsules. Eating cranberries and drinking cranberry juice is generally considered safe and without the risk of major side effects. However, cranberries have a laxative effect and excessive ingestion can cause diarrhea. 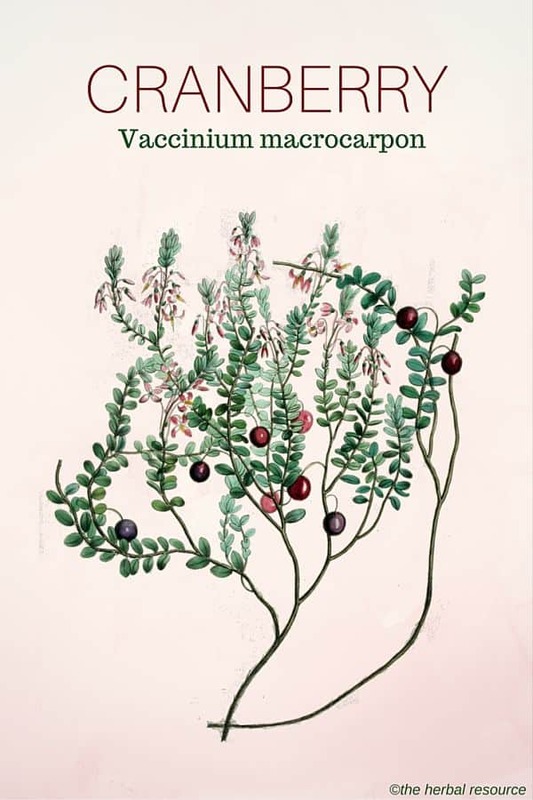 Duke, James A.: Dr. Duke’s Essential Herbs. Rodale Reach 1999. Foster, Steven & Varro E. Tyler: Tyler’s Honest Herbal. A Sensible Guide to the Use of Herbs and Related Remedies. Fourth edition. New York & London, The Hayworth Herbal Press 1999. Karalliedde, Lakshman & Indika Gawarammane: Traditional Herbal Medicines, a guide to their safer use. London, Hammersmith Press Ltd. 2008. 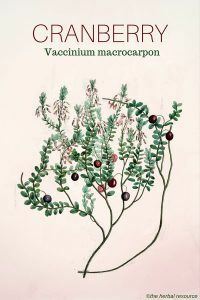 McCaleb, Robert, Evelyn Leigh & Krissta Morien: The Encyclopedia of Popular Herbs. Roseville, Prima Health 2000. White, Linda B. & Steven Foster: The Herbal Drugstore. The Best Natural Alternatives to Over-the-Counter and Prescription Medicines! New York, Signet 2002.